GAMEXPO is San Antonio’s premier gaming convention. GaMexpo will be providing San Antonio with all forms of gaming such as roleplaying, board games, card games, miniatures and video games. The convention was founded by Vince and Colleen Guzman who have their own independent gaming companies in San Antonio, they have attended and volunteered at numerous conventions throughout San Antonio, and they produce and host the San Antonio You Tube show Geek Out SA. They are joined in this endeavor by volunteers who have worked diligently to help build up the gaming community in the San Antonio area. Chris Leder is a game designer, content creator, and overall familiar face in the gaming industry. His game designs include Roll For It! by Calliope Games and Trainmaker by AEG, as well as collaborations on City of Gears (with Daryl Andrews) by Grey Fox Games and Imagineers (with Ken Franklin) by Maple Games. Chris created the tongue-in-cheek tutorial series Shut Up And Watch Dice Hate Happen on YouTube, and serves as the Director of Fun™ at Calliope Games, the publisher of Tsuro. 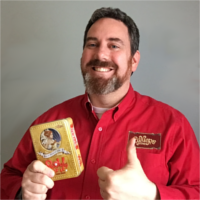 When not busy in the world of tabletop gaming, Chris has fun with his wife and three kids in a quaint town outside Chicago. Inked Geek AtelierThe Inked Geek Atelier started her cosplay journey in 2008 at the lovely age of during 8th grade. She had no wig, no makeup, and it was her first time sewing anything other than an embroidery project. The fun of being surrounded by fellow geeks fostered a love of cosplay and conventions. Fast forward to present, she has multiple awards for sewing and cosplay and features in various forms of media. She loves to share her abilities and skills by hosting classes with the San Antonio Public Libraries, introductory panels, wig design, and patterning panels at cons around Texas and formerly Colorado. She currently fabricated over 70 costumes (not including commissions) ranging from simple school uniforms to detailed gowns. Game that Cosplay started in 2013 with a chance adventure to a local comic book convention. In his cosplay adventures, he snagged a few awards, (rescued a princess), and leveled up his skills. He specialized in prop fabrication to bring the characters to life. 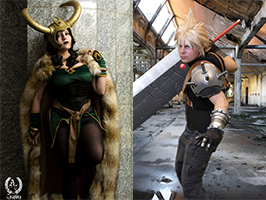 Game that Cosplay aspires to give back to the cosplay community by sharing his knowledge and talents with tutorials and prop fabrication panels.